If there are a lot of negative opinions about your brand, social media may become your worst enemy. We often hear that brands should engage in meaningful conversations with fans through social media. But when there is a lot of controversy or negative opinion around a brand, asking people on social networks to speak up might not turn out the way you expect. McDonald’s experienced this when they initiated the hashtag #McDStories, in an attempt to get people to share nice stories about the fast food giant. Instead, people who disliked the brand, hijacked the hashtag on Twitter and started tweeting complaints and snarky comments. 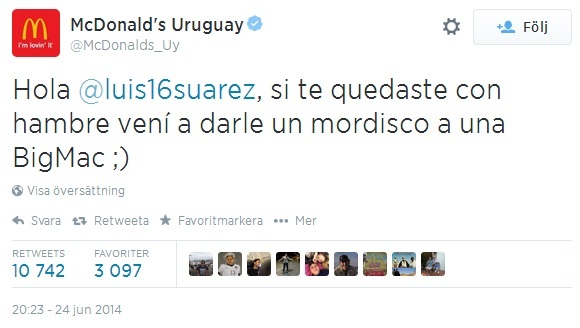 A similar thing is currently happening for the Liverpool FC striker Luis Suárez. He has been involved in a number of contorversial incidents during the football season in the UK, being suspended for racist comments against Manchester United defender Patrice Evra for example. And then later refusing to shake Evra’s hand before a game, later in the season (disclosure: I am a United fan). 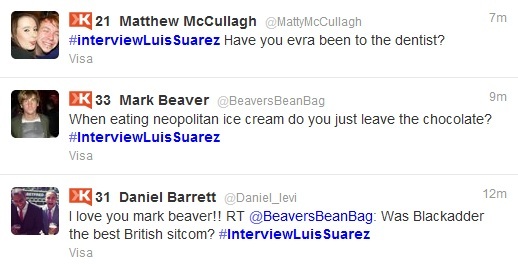 Today, Suárez is taking questions from Twitter users under the hashtag #InterviewLuisSuarez. More than six hours ago, he tweeted that he would now be answering questions. But no answers have yet been posted by the forward. That might be due to the fact that the hashtag is more or less filled with accusations about racism and nasty comments about Suarez’ looks. Once again we see that brands (or celebrities) underestimate the power of social media and that they really have no control over it. If you invite people to participate, they won’t automatically show up and play nice. If your house is not in order, you will learn the hard way what people really think of you. In social media, it is just as important to know what your fans think as it is to know what your enemies think.